On Tuesday 18 February I, along with several other members of the Green Party, attended a packed meeting in Derby. This was the second meeting this year at which John Hilary, Director of War on Want, had spoken about the threats posed by TTIP (the Transatlantic Trade & Investment Partnership). The people were then asked to form four groups to focus on one of four areas threatened by TTIP – Jobs, Health and NHS, Food Safety and Animal Protection, and World Trade. People were asked to suggest what actions we could take in Derby. What can we do? One thing everyone at the meeting agreed was the need to use every available means to make voters aware of the serious threat to our way of life that TTIP poses and to ask them to challenge all candidates on whether they are for or against TTIP. In terms of political parties, we know that the Conservatives, Lib Dems and Labour are all in favour of TTIP, and UKIP is in favour of what TTIP is setting out to do but just doesn’t think it should be negotiated by Brussels. The Green Party (and Plaid Cymru) is the only main party that is against TTIP. 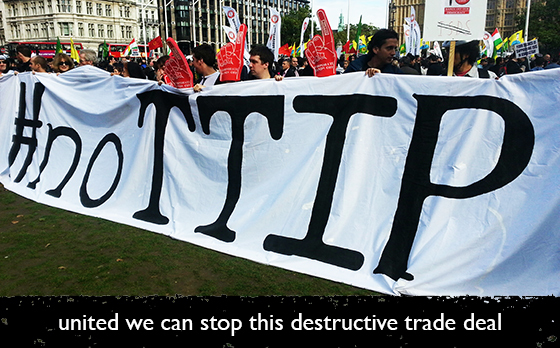 Greens can work through our party structure and our MEPs to try to stop TTIP’s progress. We can also join with many other individuals and groups such as War on Want, Derby Peoples Assembly, the Unions, Friends of the Earth, 38 degrees and many others worldwide who are all working towards the same goal. 1. A Threat to Democracy – if agreed, TTIP would give corporations the power to sue governments over decisions that could harm their future profits, undermining democratic decision-making made in the public interest. 2. A Threat to Public Services – TTIP will create new markets in public services such as health and education, leading to greater liberalisation and privatisation. It would also make it very difficult to bring these services – as well as our energy and water – back under public control or renationalise them. 3. A Threat to Food Safety – Through a harmonisation of good safety regulation, EU food safety standards would be lowered to US levels. This would remove EU restrictions on genetically modified organisms (GMOs), pesticides and hormone-treated beef. 4. A Threat to the Environment – TTIP would see EU environmental regulations being harmonised and reduced to US levels, allowing a US-style fracking boom in the UK and elsewhere in Europe. 5. A Threat to the Climate – With strong investor rights, TTIP would allow corporations to sue governments for bringing in new policies to leave fossil fuels in the ground. 6. A Threat to Workers’ Rights – Workers’ rights could be reduced to US standards and businesses could relocate to US states and EU countries with the lowest labour standards. 7. A Threat to Personal Privacy – Leaked documents indicate that TTIP could be used to reintroduce central elements of the Anti-Counterfeiting Trade Agreement (ACTA), which was rejected by the European parliament after popular protest. This could force internet providers to spy on their customers. 8. A Threat to Financial Control – TTIP is set to remove many of the new financial regulations (such as banking safeguards) that have been introduced since 2008 to prevent a future financial crash. 9. Negotiated in Secrecy – While corporate lobbyists are playing an integral role in negotiations, the public have been shut out. All negotiators must sign nondisclosure agreements. There is no access to the draft text or the agreement – even for MPs – so most of what we know is from leaked documents. 10. A Dangerous Blueprint for the Rest of the World – If TTIP is agreed, countries in the global south will come under huge pressure to apply TTIP standards to avoid losing trade. The business lobby are upfront about their aim of creating ‘global convergence towards EU-US standards’. This would see free trade policies forced on poorer countries, that they have had no part in negotiating. Greens say no to TTIP – If TTIP goes through there will be no point in electing a government, it will be government by corporations! This entry was posted in Derby, Derbyshire County, Economy and tagged democracy, Economy, free trade, Green Party, TTIP. Bookmark the permalink.